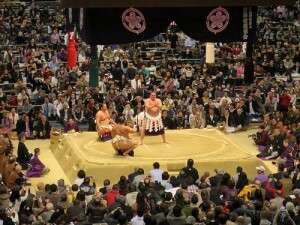 Sumo is a beloved sport of Japanese citizens. For those unfamiliar, it is a martial art where sumo wrestlers wearing nothing but a mawashi around the waist grapple in a dirt ring called a dohyo. The event is watched by many in the sports stadium. 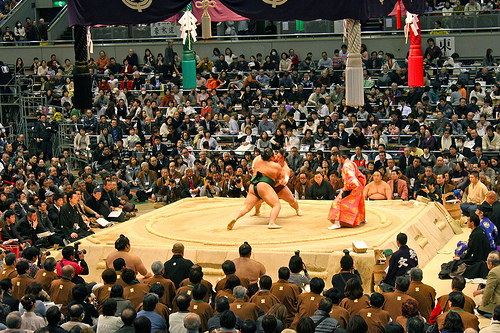 Whichever wrestler who steps out of the sumo ring, or whose body part touches the ground, loses. The foreign sumo wrestlers increased, too and became globally famous. 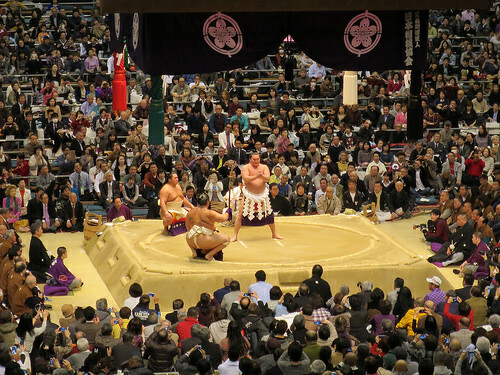 The history of the sumo is very old. A state playing sumo is drawn on the grilled dish made in Burial Mound age. I adopt sumo by a class of the physical education in the Japanese school. All the Japanese boys have played sumo. There is a condition to become a sumo wrestler. More than 173 centimeters tall more than 75 kilos in weight. When height and the weight were not enough, I hit a head and made a bump, and there was the person who swilled a large quantity of water in old days. There was the sumo wrestler who put silicon in the head by an operation before the measurement. It is a famous sumo wrestler in Japan. The sumo wrestler has a large quantity of meals every day to increase the weight. The foreign sumo wrestlers increased recently, too. 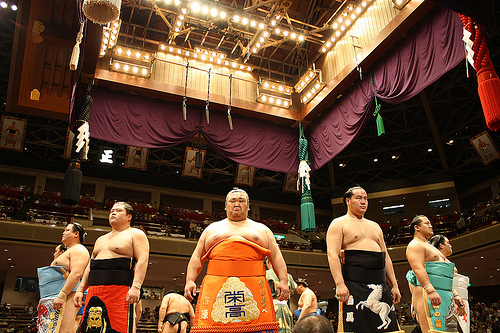 More than 180 centimeters tall, there are many sumo wrestlers more than 100 kilos in weight. The hairstyle that the characteristic of the sumo wrestler is unique. It is called Mage in Japanese. The hairstyle of the samurai is a kind of mage, too. The sumo wrestler dresses mage permitted only a sumo wrestler called the fanwise-topknot hairstyle. It is called Oicho in Japanese. The meaning to prevent a brain has Mage. The new face sumo wrestler grows hair to dress this Oicho. It is also the other. The mawashi which a sumo wrestler binds a waist with. The belt which was made with silk with the mawashi. 10 meters in length, 4-5 kilos in weight. The apparel of the sumo wrestler is only a mawashi. This proves that I do not have a weapon. It is an origin it becomes the loincloth figure which was old underwear, and to have taken the sumo. And the mawashi such as the apron to attach when a sumo wrestler enters the sumo ring is a makeup mawashi. It is called Kesho-mawashi in Japanese. The luxurious embroidery of Kesho-mawashi is very beautiful. It is a pattern original one by one. It is pleasant to compare it!